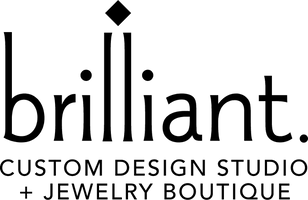 At Brilliant, we delicately marry the best of old world craftsmanship with current, state-of-the-art techniques - moving into the future while honoring our past. We collaborate, we illustrate and we create. Jamie’s got big shoes to fill. His Great-Grandfather was a watch and jewelry craftsman. His Grandfather was a world class watch craftsman - he founded Harold Jaffe Jewelers, the premiere jewelry store in Toledo, Ohio. Jamie’s father and uncle run the store today, now in its 7th decade, and have received numerous prestigious awards in the jewelry industry and for their support of the arts community. Jamie's passion for helping people find the right jewelry comes from this heritage. Jamie is a people person and believes - more than anything - that's what his job entails. Understanding what someone needs in jewelry, from style to price and finding the perfect piece to match both. He is a talented designer in his own right and loves the creative challenge of taking old jewelry and turning it into a new, adored piece for clients. Jamie has also spent over a decade honing his expertise in diamonds while working alongside his mentor, Lazer Wolf, one of the world's best known diamond cutters. Growing up in the New York City area, Katie is no stranger to art, fashion and jewelry. She feels right at home in Historic Roswell surrounded by galleries and restaurants. A graduate of Emory University and Bank Street College of Education, Katie's background in history and teaching has prepared her well for her role at Brilliant. Her desire to fill the cases at Brilliant with "the right piece for every client" provides an array of fashion jewelry that tells a story at every price point. Katie and Jamie are both graduates of the Gemological Institute of America (GIA) and Brilliant is a proud member of Jewelers of America.